The aggressive poaching of rhinos needs to be countered with equal aggression. So argued Prince Bernhard of the Netherlands, the founder president of the World Wide Fund for Nature (WWF), at a 1987 meeting with John Hanks, conservation expert and WWF’s head in Africa. The result was Operation Lock, a secret initiative funded by Prince Bernhard and staffed by former SAS operatives. Operation Lock set up headquarters in Johannesburg and extended its reach into neighbouring states: Namibia, Zambia, Botswana, Swaziland and Mozambique. 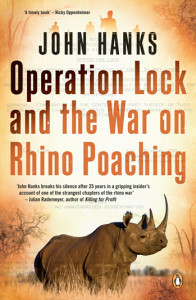 Its operatives planned to train game rangers, to pose as rhino horn traders in order to entrap buyers, and to expose the kingpins who were driving the trade. It was a controversial approach, all the more because it was working within apartheid South Africa in the late 1980s. When the existence of the project was finally leaked, WWF denied any involvement, and John Hanks took the fall.